Our monthly series of Taizé services at St Clement's continues, with our first Eucharist this Friday evening. 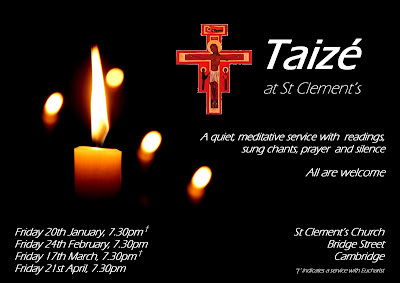 We hope you are able to join us at 7.30pm for a quiet service of prayer, meditation and singing. As 2016 draws to a close, we can look back on what has been a year of change and growth at St Clement's, and look forward to continuing this into 2017. 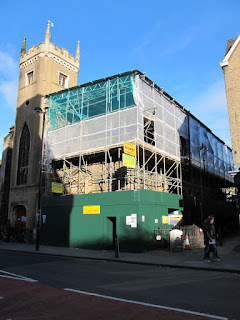 We were excited to finally start work on restoring our damaged South Aisle roof. Supported by the Listed Places of Worship Roof Repair Fund; completion is scheduled for early 2017, and we hope to take this opportunity to also restore some of the interior of the church, brightening up our side chapel and repairing some of the water damage to the interior walls whilst we have scaffolding in the church. 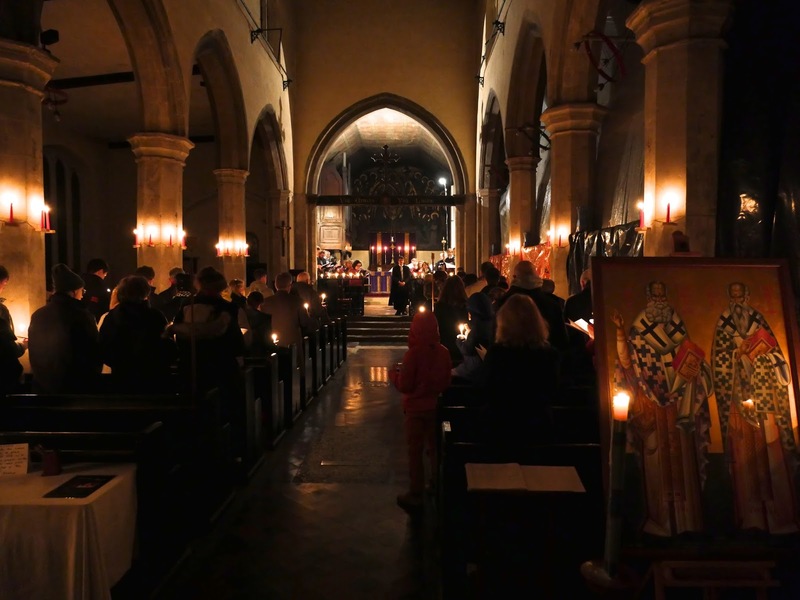 Despite the repairs, regular church life has been largely uninterrupted, with weekly Sunday morning sung Communion Services continuing, as well as our increasingly popular monthly Taizé services on a Friday evening. A number of new initiatives were also started in the church, most notably our Wednesdays at St Clement's lunchtime group. This has been organised largely through the efforts of Rev'd Helen Orr, Curate at St Andrew's Chesterton, who we are growing ties with. These have ranged from quieter, meditative prayer meetings, or children's activity days, through to solo song recitals, shared lunches or festive community sings. We will continue these into the new year and look forward to perhaps seeing some new faces there too. The choir, led by Director of Music Karol Jaworski, continues to grow and contributes to weekly worship with regular sung anthems and voluntaries. Summer 2016 saw the first ever choir tour of the new choir, visiting St Illtyd's church in Llantwit Major in South Wales where the choir sung for two services, including a Choral BCP Evensong service with sung canticles, responses and an anthem. 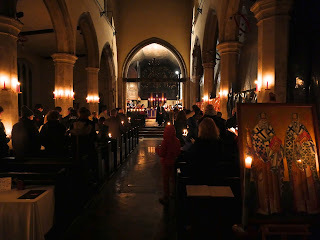 Other notable events have included a splendid concert performance by the Cambridge University Recorder Ensemble (whose players often support music for Taizé worship on Friday evenings) and St Clement's Choir taking part in workshops and events in Cambridge and Ely. Some exciting collaborations have seen the choir join with the choir of The Chapel at Churchill for an evensong service, and The Orlando Singers coming to St Clement's to sing with our choir for our annual Festival of Lessons and Carols. It was with sadness that we heard this year of the death of Fr Bill Pickering. Fr Bill had played an important part in the life of St Clement's, and had often celebrated Communion and preached at the church. In his last years, though increasingly unwell and frail, he still maintained a close connection to the church, coming to services when he could, and often being visited by some of our current active clergy. He will be missed by many in the church, who remember him fondly. 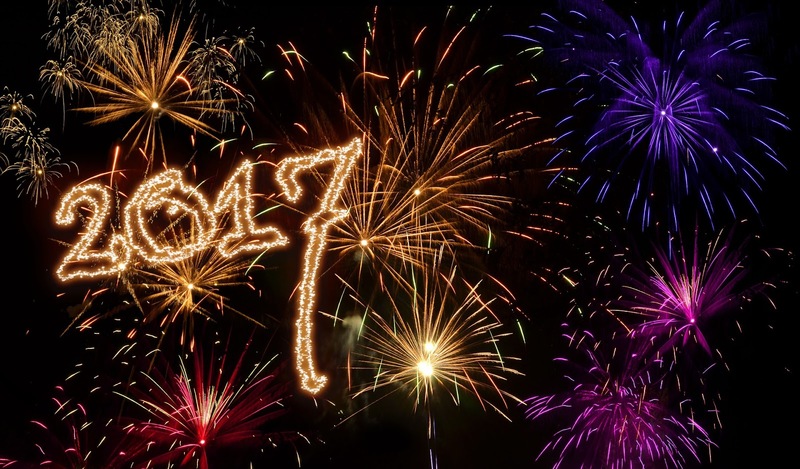 As we look ahead to 2017, there is much to be excited by. We are hoping to secure additional funding to complete interior restoration and preservation work to the church funding, improving appearance and facilities for our community and visitors alike. Supported by generous donations, we are hoping to acquire a baby grand piano for use in the church and hope to use this in the regular worship at St Clement's, as well as develop the role of the volunteer choir further. We look forward to welcoming back Bp Rowan Williams to celebrate and preach with us again in the coming few months, as well as Bp David Thomson who will be visiting us after Easter. 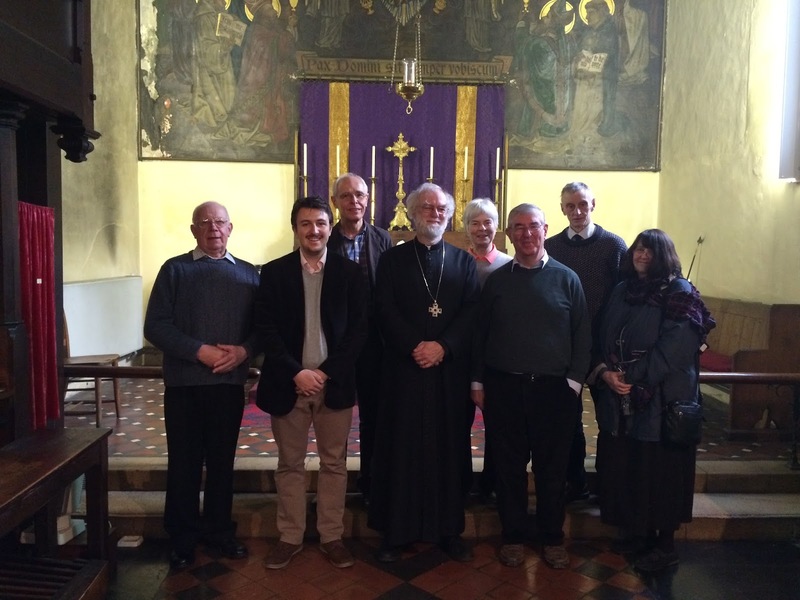 Our weekly worship continues to be supported by our rota of clergy, led by our Priest-in-Charge, Canon Nick Moir. 2017 also offers us the opportunity to grow and strengthen established links to other communities and groups, as well as perhaps establish and nurture connections with new partners and people who may be able to contribute to and grow the spiritual life of St Clement's further. We're very excited to see what happens. St Clement's is on an exciting and challenging journey in response to what we believe is God's call to us. We are already discovering that partners - including some unlikely ones - have been drawn in to exploring how we can work and pray together to discover what the Spirit is leading us into. Perhaps you could join with us in some way? But whatever the new year holds for you, thank you for reading this far and may you have a rewarding, even exhilarating, 2017!